Zion Market Research has published a new report titled “Point of Sale Software Market by Software Setup (Cloud-Based and Native), by Product (Mobile POS and Terminal POS), and by End-User (Retail, Government Sector, Healthcare, Hospitality, Media & Entertainment, Warehouses, and Others): Global Industry Perspective, Comprehensive Analysis, and Forecast, 2017 – 2024”. 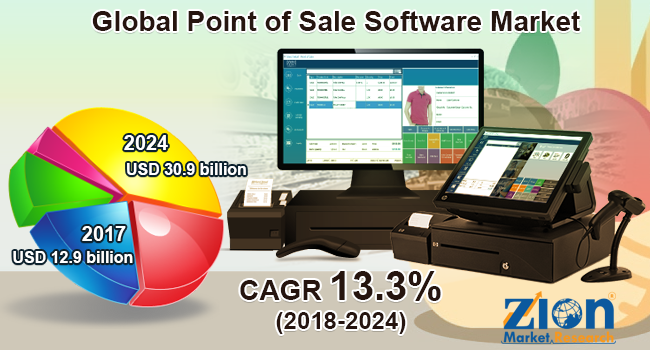 According to the report, the global point of sale software market accounted for USD 12.9 billion in 2017 and is expected to reach USD 30.9 billion by 2024, at a CAGR of 13.3% between 2018 and 2024. Europe is anticipated grow considerably in the point of sale software market over the forecast timeframe. The growth is anticipated to the increasing adoption of cashless payments by various sectors. UK, France, and Germany are expected to make significant contributions to the regional market over the estimated timeframe. The Middle East and Africa region is anticipated to hold a significant share of the point of sale software market by 2024, due to the increasing adoption of IoT in Saudi Arabia and UAE, among other economically developed countries in the region.